During WW1 Folkestone was not bombarded from the sea so although the guns could be heard across the sea the town did not suffer much damage except for one air raid which took everyone completely by surprise. The town had no Air Raid Warning system and no Anti-Aircraft guns. 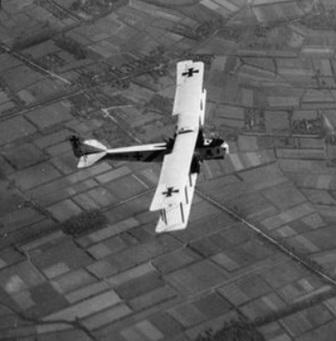 On Friday 25th May 1917 a flight of 23 Gotha planes set out for a raid on London. Two planes had to turn back on route and when the remaining 21 reached London it was covered by a thick layer of cloud. The aircraft turned south into Kent. They shed their bombs firstly south of Maidstone and on villages towards Ashford. The first death and injuries occurred when 6 bombs landed in Ashford. Several bombs fell on villages along the Royal Military Canal. 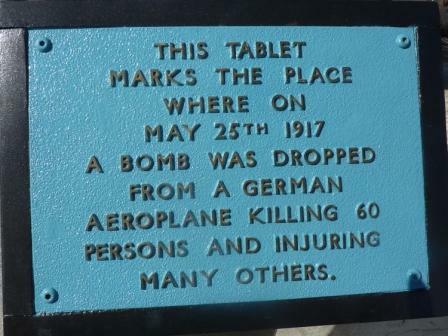 Next the Aerodrome at Lympne was targeted causing little damage. The aircraft next approached Hythe where 20 bombs fell causing two deaths. Planes then attacked Shorncliffe Camp (where there were 18 deaths including 16 Canadian Servicemen), and there were further deaths in nearby Sandgate and Cheriton. Finally the target was Folkestone, where 40 bombs fell. 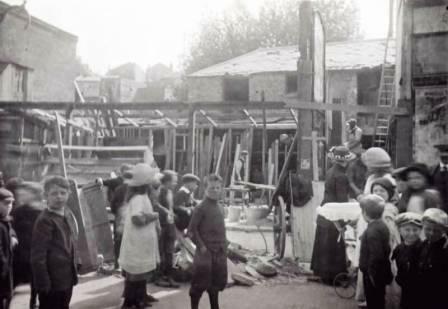 Several fell in the Station area but the worst damage was in Tontine Street when at 6.22pm just one single bomb fell right outside Stokes Brother′s Greengrocers (where a queue had formed after a fresh delivery of potatoes) and opposite Gosnold Brother′s Drapery. It was a beautiful sunny Friday afternoon, the day before the Bank Holiday weekend. The Street was crowded with civilians, workers, shoppers and children and the deaths and injuries were terrible. 63 were killed, 10 men, 28 women and 25 children. More than 100 were injured. 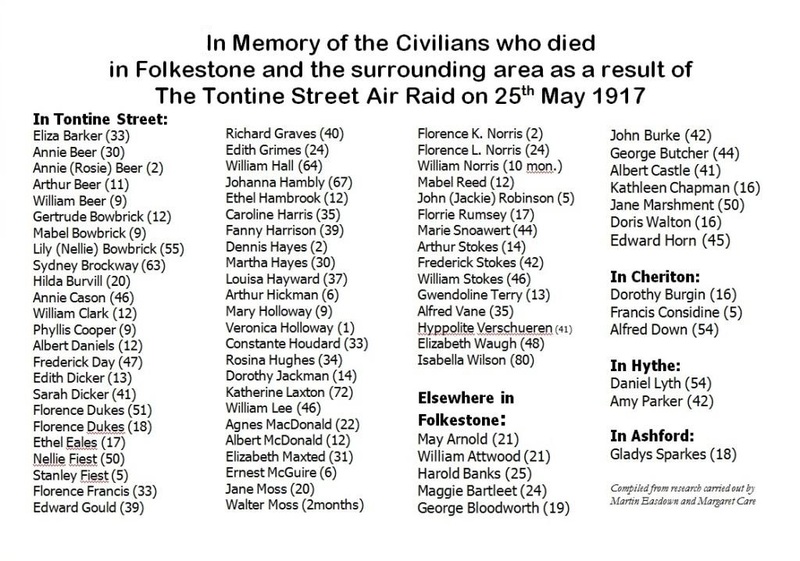 There were 18 civilian deaths elswhere in Folkestone. 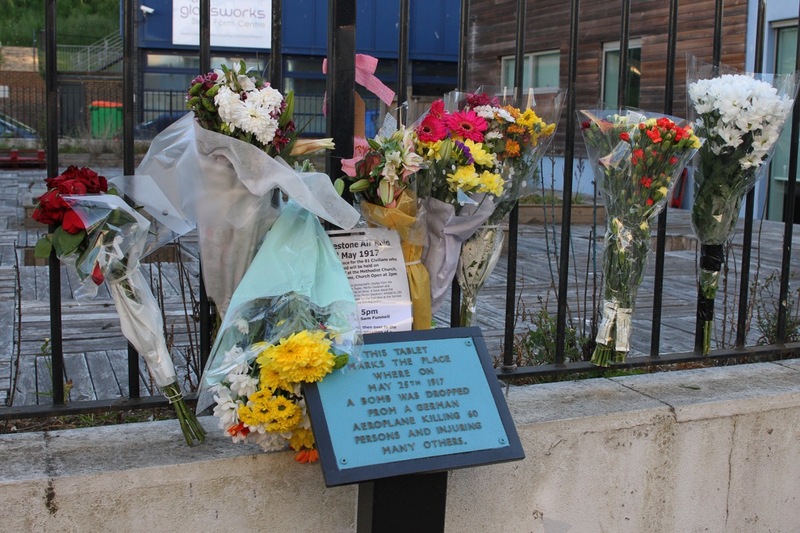 William Henry Stokes, 46 and his son Arthur Ernest, 14 died from their injuries. Frederick Charles Stokes, 41 was injured and died 1918 having never recovered from his injuries. George Gosnold was injured. Two of the very young children in the street that day were my aunts. They had gone to Gosnold′s Drapery on an errand to buy elastic and had left the shop before the raid. They were both injured by schrapnel, one in the legs and the other the head. A lady they knew told them to run home up the street and St Michael′s Street Steps to Saffrons Place. Unfortunately, on hearing the explosion, Gran had run the more usual route to the centre to find them and was searching for them among the bodies. When she returned home she found the injured children, all the ambulances and doctors were overwhelmed so she cleaned and dressed their wounds herself. The doctor said later her thoroughness saved their lives. They were like many others, the unreported injuries. 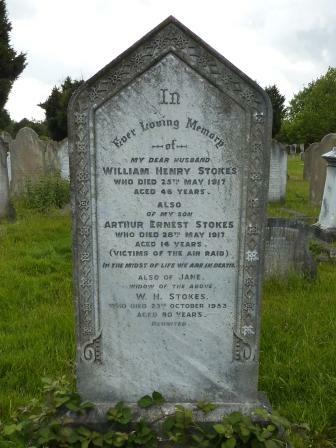 Jane, wife of William Henry Stokes was their Great Aunt born Jane Cook 18 November 1862. She was the youngest daughter of Stephen Cook and Eleanor Baker m.10 December 1842. A full list of deaths is given below and a list of the known injured can be found on the memorial page. HERE.